We-Ambassadors: What did it say? 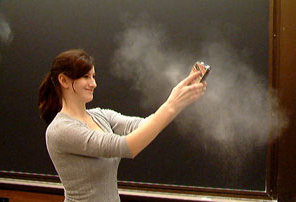 Have you ever noticed the cloud of dust that comes from a dropped chalkboard eraser? What words were erased? Was it a drawing? Or just some kid doodling on the board before the teacher came in? Why was it erased from the board? Did the kids remember it? Did they take notes? How did our words become disposable? How many great things or works of art are lost forever in a cloud of white dust? Wouldn’t it be cool if, when the eraser hit the floor all those words were released into the air OUTLOUD? What would it sound like? What would the drawings come out like? Are you still reading this? Really, that’s just weird. If this got you thinking you may just have a little Emo in you! If you don’t know what Emo is then stay tuned. Yep, you've got some serious issues. Now if you just post that EMO video, we'll KNOW you have issues. Rest assured people....Claude is taking your children to the beach this weekend. Sorry it's taken so long to mock you. I'll try to make up for it. Chalk? Most boards now are dry erase. Wow. You can tell you're getting old.